Spring is the inspiration for this cake. 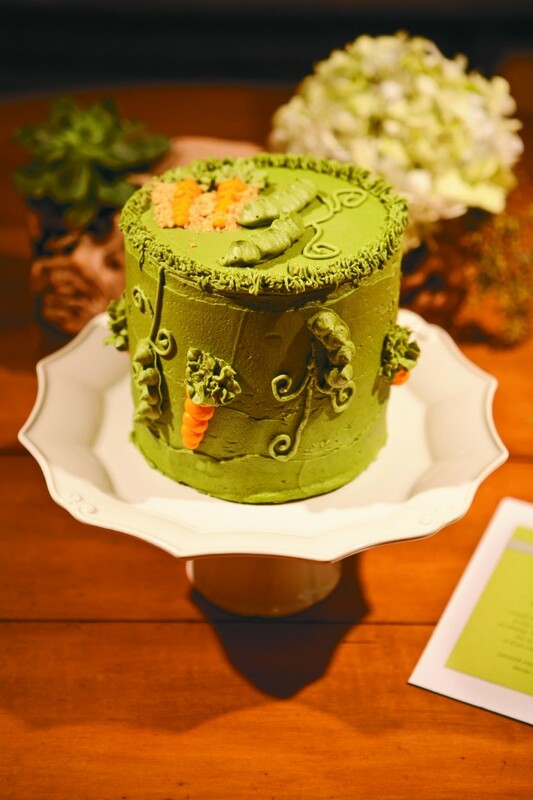 Iced in a Spring green and embellished with tender vegetables, this is sure to be a hit at your next event. The decoration on this cake is not for the beginner – it does take a bit of practice. Remember to always use the best ingredients you can afford when you bake and cook. This recipe makes a 6″, 4-layer cake. I rinse my carrots, I don’t peel them as I believe there is so much nutrition in there I hate to waste it. With respect to frosting the cake, the next time I do this, I will separate out two cups and tint that darker while having the filling and main body of the cake be lighter. Always learning and growing. In the bowl of an electric mixer combine shredded carrots, crystallized ginger, vanilla bean paste, canola oil, eggs, sugar and buttermilk. Mix on low and when combined add baking powder, salt, cinnamon and pecan pieces. Finally add flour and mix until all the flour is incorporated. Prepare four 6″ cake pans by spraying them with Bak-klene. Place into a 375 degree, preheated oven and bake for 30-35 minutes – until toothpick inserted comes out clean. Remove from oven and allow to cool in pans for ten minutes, then invert onto cooling rack to fully cool down. Wrap in plastic wrap and place in refrigerator overnight to fully chill. In the bowl of an electric mixer fitted with whip attachment combine butter, shortening and cream cheese beating it for five minutes – scraping bowl as necessary to mix all ingredients together. Turn mixer on low and add vanilla and powdered sugar, beating for five more minutes. Separate out 2 cups of icing and tint orange. Separate out another cup and tint it a darker shade of green you tint the remaining icing in the bowl so you have a shade difference between the two. Level off cake tops and place onto cake round, securing it with a dab of frosting. I place roughly 1 cup of icing in between each layer. When you smoosh it down, some if the icing will ooze out and you will not have to worry about filling in any gaps.